Neal Greig was born in Belfast in 1965. He studied BA Hons in Fine Art at Edinburgh College of Art from 1983 -1987 then went on to a Post Graduate in Drawing and Painting 1988 – 1989 he was awarded The Andrew Grant Scholarship for Post Graduate Study. 1991 he was Artist in Residence at the Tyrone Guthrie Centre . Neal has been awarded residencies namely The Vermont Studio Centre in Vermont USA , Ballinglen Fellowship, O’Reardon House Fogo Island Newfoundland , Invited Artist with Ontario Art Society Field Trip, Cill Raillig Art Studios. In 2011 Neal received the Pollock Krasner Award from the Foundation in New York. He has received various commissions , The Patrick Kavanagh Bicentenary Monaghan County Museum, Queens University Department of Palaeocology and has worked on a variety of community art projects. More recently Neal has worked Artist in Prison scheme through the Arts Council of Ireland. Neal has exhibited widely in Ireland most recent one person exhibition Doorway Gallery Dublin, Custom House Studios Mayo and in June 2017 Alley Art Centre Strabane Claremorris Contemporary Fine Art, He has also exhibited in Chicago at the Lyon Fine Art, Fidra Fine Art Scotland, Compass Gallery Glasgow and Barbara Stanley Gallery London. 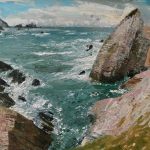 He has had many group exhibitions most recent , The Hammond Gallery , Gormelys Fine Art. In 2013 Greig exhibited in the Royal Academy Annual Summer Exhibition London and has exhibited in the Royal Ulster Academy on several occasions. His work is held in Public , Corporate and Private Collections .Office of Public Works , Boyle Civic Collection, AIB Bank , Limerick County Council , Lady of Lourdes Hospital Drogheda, Bank of Ireland, Beaumont Hospital, ACC Bank , Mayo County Council, Monaghan County Museum. 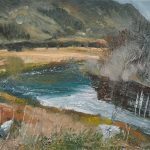 Neal Greig was in the Irish Arts Review magazine in 2016 for his one person show Wild Spaces in the Claremorris Fine Art, he has received reviews in various publications , Clef Note Chicago , Irish Times , VAI Magazine. 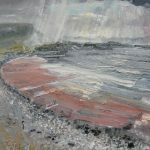 ‘As an artist, Greig is able to capture the unique, organic quality of each moment, and with each textured brushstroke, he adds another temporal level to the piece. Greig’s Beeches at Caledon, uses various greens and browns to produce the intricate criss-crossing of the various tree branches. These colours provide depth to the piece and draw the viewers in until they find themselves enveloped within an intriguing and mysterious aura. As in most of his works, Greig’s colours, true and vivid, impress upon the viewer his unique visual reality, offering a visceral impression of what the artist experiences personally upon the first sight of his object of interest. His works offer tangible evidence of the inherent beauty of nature’ . Neal has been working and developing his art practise over 20 years . 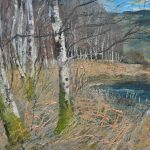 His inspiration comes form the quiet corners of woodland and lakes of Tyrone , Fermanagh, Armagh and Monaghan as well as the west coast of Ireland, and further field. He has developed his painterly language on location, responding to the environment and the passing of time . These ideas and themes are translated into larger studio works. Neal Greig is currently based in Glaslough County Monaghan.